There are two common types of foresight practitioners. The first, the futurist, is commonly known in public, but is a rarity in the workplace. The second, the strategic foresight professional, or foresighter, to use a shorthand phrase coined by Andy Hines and John Smart in 2014, is less well-known by the public but is by far the main type of practitioner, and the main intended audience of this Guide. A futurist is anyone who speaks or writes publicly (and typically more than once) about the future of any topic. The term usually connotes a qualitative, story-driven approach to the future, and the approach of a generalist. This isn’t always true. A minority of futurists are quantitative, evidence-based, and predictive in their storytelling as well, and we will introduce several in this Guide. But to tell their stories, all futurists rely at least partially on personal insights, intuition, narrative, and anecdotal experience to guide what they do, and they differ widely in their use of analysis, evidence, and quantitative methods. As a rule, futurists enjoy thinking about the future, and the more professional ones also spend a good deal of time consuming, producing, critiquing, and communicating futures content. A foresight professional (foresighter) is anyone who is paid to do foresight work for others, using any of a wide variety of specialty practices and methods we will discuss, and typically in one or a few specialized industries and contexts. The word “foresighter” is good single word to substitute for “foresight professional”, and we advocate its usage by all foresight practitioners. By analogy, think of officer, insurer, treasurer, manager, leader, and other descriptive words that end in -er, and that describe important organizational functions. As an ideal, the term foresighter connotes not only specialty practice competency, but a diverse and more balanced use of both qualitative and quantitative approaches to foresight than the typical futurist. Foresighters tend to prefer reason and evidence first and story and aspirational thinking second, and the use of critique and various formal methods over argument or exposition to guide their practice. They are more apt to practice in just one or a few industries, to specialize their clients, and some focus on specialty activities, like gathering intelligence, to the neglect of other foresight methods, or on improving foresight methods, like risk management, to the neglect of foresight process. The Guide seeks to help each of us become better futurists and foresighters. Every one of us have been both futurists (speaking publicly to others about the future, even if it is regularly done just to one or two others, on just one or two topics) and foresighters (looking to and analyzing the future for pay, for others) at various times in our lives. These two roles often overlap. But the market for foresight is perhaps a thousand times larger than the market for futurism, if we were to venture a first guess on the number of orders of magnitude separating the two. Both roles are useful to society, but far more people are engaged in full-time foresight work. In personality most futurists are like foxes, seeking to know a little about many different things. A few are like hedgehogs, knowing a lot about a few things. Many foresighters, by contrast, and perhaps even most, are hedgehogs first, and foxes secondarily, as their past experience and job allow. For more on these two key personality types, see Chapter 2. Whether you are a futurist or a foresighter, you should strive to become a “T-shaped” practitioner, to use a term coined by journalist David Guest. The horizontal bar of the T represents your “fox-like” qualities, how broadly you understand futures issues and foresight methods in different disciplines, and how well you can collaborate in disciplines outside your own. The vertical bar of the T represents your “hedgehog-like” specialist abilities and credentials in at least one well-recognized professional discipline, like the twenty foresight specialties we introduce later in this chapter. We are all at least T-Shaped, and should strive to be Star-Shaped. Being skilled at any one of these twenty specialties (actually, forty specialties, as each specialty actually is a group of two that go together well) is usually enough for anyone to be able to do good foresight work on a team in an organization. But as one becomes T-shaped, it is easier to work with others who think differently from you, and to move into management and leadership. After becoming T-shaped, with some broad understanding of different aspects of your organization and the world, it often makes sense to become “star-shaped”, with expertise and credentials in multiple specialties. This can further improve your effectiveness, and make your work more unique, particularly in interdisciplinary areas between your specialties. A few foresight practitioners, with time and experience, will even become polymaths (“Renaissance people”) gaining deep expertise in several specialties. If you are an autodidact (someone who enjoys self-directed learning) becoming a polymath is both an achievable and desirable goal. 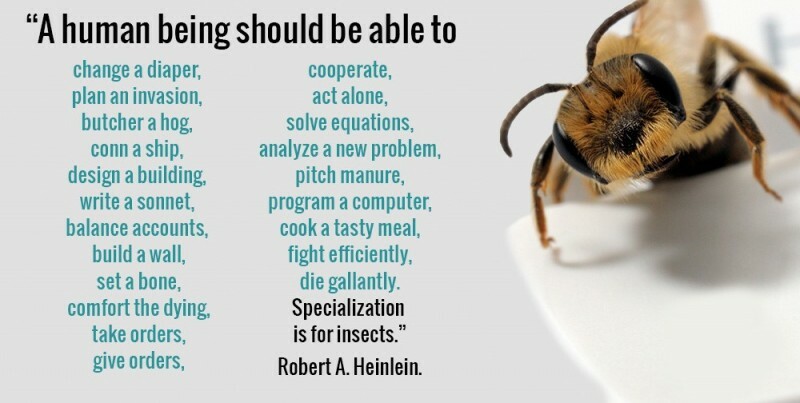 As Robert Heinlein famously said, “(total) specialization is for insects.” We all must specialize in at least a few things, but good foresight thrives on having general knowledge and experience, and a cognitively-, skills-, and experience-diverse community of clients and colleagues that can solve problems with us, and continually give us critical feedback. All foresight practitioners shift perennially between these two roles, that of futurist (storytelling, provocateur) and foresighter (specialist, researcher, strategist, consultant) as context dictates. But as we will see, the much larger numbers, narrower and more evidence-based focus, and less grandiose titles of foresight professionals tend to make them both more trusted and more successful in business environments. Being effective in either role requires developing insight into and empathy with client problems, learning their worldview and languages, gaining trust, and demonstrating value. Both groups are quite capable of this, but futurists have handicaps to overcome that foresighters lack in client engagements, making it harder for them to easily achieve these outcomes. Let’s take a look at a few of these “futurist handicaps” now. Because the term futurist is publicly used to describe anyone who tells stories about the future, it can be snickered over in boardrooms and organizations, where practicality dominates. The futurist community includes imaginative futurists, whose future tales are entertaining but not always evidence-based, utopian and dystopian futurists, who offer visions that can inspire or scare us but have little or no probability of occurring, and preconventional futurists, dreamers and eccentrics who cheerfully pursue their personal visions outside the norms and conventions of society. These individuals will always be with us, and I believe they will always keep the wider futurist community from having deep business impact. Future stories can have great value, particularly in influencing others, but they are just one tool in the leader’s toolkit. Sometimes, one clarifying bit of critical data, one good model, or one new key causal inference can be worth a thousand stories for a leader who needs to create strategy. That is why, if you speak as a futurist to organizational audiences, you must strive to be evidence-based, both quantitative and qualitative, to tie your stories to strategic implications, choices, and actions, and to offer examples of measurable results. If you are a public speaker, author, or other public personality, the word “futurist” will commonly be used by others to describe the public part of what you do, making it a title hard to avoid for those individuals. But beyond your public speaking and media, the term futurist is usually best minimized, both in organizational environments and in your formal titles. Instead, as a foresight professional you are usually best served to use a more specific and well-recognized title, like strategist, forecaster, designer, analyst, trend researcher, technology scout, risk manager, planner, intelligence analyst, innovation manager, risk manager, investment manager, evangelist, community manager, or many others to describe your professional work. If you want to be adventurous, use the word “foresight” somewhere in your title. Because the term is less known, you can position your work and value contribution in an uncontested way within your organization. For tips on that, see Kim and Mauborgne, Blue Ocean Strategy, 2015. Most foresighters generate foresight without the aid of a self-description that makes it too obvious they are doing so. In practice, a lower profile can even be an advantage, particularly in change-averse, high-stakes, or troubled firms, where the future can be a very politicized topic. Foresight can be practiced at any systems level, and in any industry. The three domains of personal, organizational, and global foresight are the three most common areas of practice, with universal foresight (science and systems thinking) being the way we ground our field. Its forward view can be over any time horizon, from the next few seconds in equity futures trading, to the next century in urban planning or climate modeling. It is both the shared methods used across each of these foresight problems, and the unique methods developed in each application that define our fertile field. In coming decades, as foresight methods become more quantified and validated, and as our computing, communication, and collaboration systems gain new capabilities, significant parts of our practice will incorporated in future social and economic sciences. For a good survey of our emerging field, and arguments and recommendations for professionalizing it, see Andy Hines and Jeff Gold’s article “Professionalizing Foresight” (PDF), J. Futures Studies, 2013. A general definition of a foresight career then might be any position, occupation, or role that intentionally and methodically engages and analyzes the future in a strategic way, either implicitly or explicitly in the job description, and results in changed intentions, plans or actions as a part of its function. 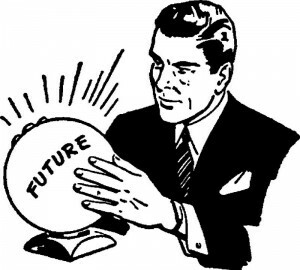 Foresight professionals, when they recognize who they are, will strive to bring diverse, future-relevant inputs, forecasts, and possible alternative futures to strategy discussions, decisionmaking and planning, and ensure that when plans are communicated and actions taken, after-action review occurs, to validate and improve the quality of future foresight. Helping foresighters to recognize who they are, and how they can improve, is the primary goal of the Guide.